This weeks recipe from my del.icio.us bookmarks is for something I had never tried before and know very little about - Pimento Cheese. I came across a recipe for Pimento Cheese years and years ago in some cookbook I no longer own. I remember being horrified by the recipe - cheese, cream cheese, mayonnaise and pimentos (although back then I didn't know what a pimento was, and I probably still don't). Made into a sandwich? Gross! 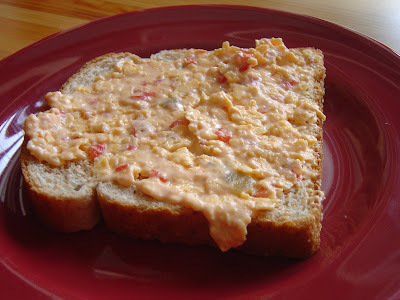 Pimento Cheese is popular, famous even, in the Southern United States. From the bit of research I did there doesn't seem to be a record of any sort of origin, but was/is popular for church gatherings probably because the ingredients were staples to any kitchen, and apparently it keeps very well. Down South you can buy Pimento Cheese premade in the stores, or of course make it at home. And there are enough recipes on the internet that you should have no problem finding one that sounds good to you. I bookmarked this recipe on February 6 2007. 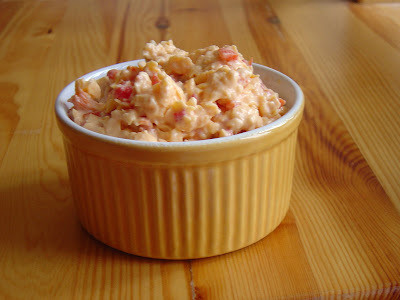 Here is Deborah at Play With Food's recipe for Pimento Cheese. Holy crap this stuff is good. I decided to give this a try mainly for the simplicity of the ingredients. I knew that even if I didn't like it, Scott would. How could he not? It's cheese and mayonnaise, 2 of his favorite things. I wanted a more chunky look so I did not blend this in a food processor. I shredded the cheese very finely with my microplane, then mixed in the mayonnaise and salsa. I used the smaller amount of the salsa and somewhere between the two amounts of the mayonnaise. I also used roasted red peppers from Superstore. Are pimentos and roasted red peppers the same thing? This was so tasty and didn't need any salt or pepper or anything. I've seen on the internet that down South not only is Pimento Cheese used as a sandwich filling, but also on crackers, baked potatos, hamburgers, and hot dogs. I even saw one recipe that had it mixed in with cooked corn. Well, another recipe down, but also another recipe added. While learning more about Pimento Cheese I came across another recipe that had garlic and pickles added in! As soon as Scott eats up this batch, I'll give that a try. Which will probably be tomorrow. Interview Meme - Lis asks the questions, AND, my garden! Recently Lis from La Mia Cucina was interviewed by Ilva at Lucullian Delights. Ilva asked 5 questions and Lis answered them on her blog. To keep the meme going anyone who wanted to take part was asked to leave a comment and she'd send you your 5 questions to answer on your own blog. I offered myself up and Lis has sent me my questions. 1. What do you like the best about where you live? The least? Calgary is a very multicultural city. There's pretty much every type of restaurant and food store you could want. The bad thing about that for me is that we live in the deep South end of the city, and all the places I want to eat at or shop at are in the far North. Between the distance, traffic and the cost of gas we don't explore as much as I'd like. We have a nice Chinatown. There are some good organic and health food stores in the south, and an ok Italian shop, although the best one is Lina's in the North. We have some beautiful parks and a great Zoo. And if you like to drink your face off for 10 days in the summer, come to Calgary for the Stampede. What I don't like about Calgary is how big it has become. The cost of living, population and traffic have all skyrocketed in the last couple of years. 2. You've been given $200 - just for you. What would you do with the money? Clothes? Shoes? Foodie items? It would get split between my 2 favorite things to spend money on - cookbooks and music. They are my crack. I'd like to get a Barefoot Contessa cookbook and so many people like Donna Hay I'd like to try some of her stuff. And I'd really like to own The Silver Spoon. Although I would really really like this or even this, and I really really really want a juicer. Can I have more than $200? 3. Everyone is getting this question, just because I wanna know! If you were told that you could only have 5 foods and 1 beverage for the rest of your life - what would they be? I am going to give 2 answers for this - 5 dishes and 5 ingredients. Bun Thit Nuong Cha Gio - Vietnamese BBQ Pork and Spring Rolls on Rice Noodles. Grilled cheese and tomato sandwiches. and for a drink, Rye and Coke. 4. Do you think if you weren't a Foodie, would you still write a blog? What would it be about? Am I a foodie? Well, I probably would want to have one. Probably journal-style. My favorite website is All and Sundry and I read it every day. But my life is boring and I am not that interesting, so I can't imagine it would be that fun to read, or write for that matter. 5. Top 5 favorite movies of all time? This is such a hard question, only 5???? Man. Dark Victory - I cry myself sick every time I watch. I saw this movie for the first time with my Mom at my Grandparents house when I was a teenager . My Mom and I kept up constant jokes and we annoyed my Nana so much she went to bed. But by the time the movie ended both of us were sobbing so hard we couldn't hear the TV. The English Patient - everything about this movie is beautiful. Shaun of the Dead - One of the funniest movies I've ever seen, and so clever. Every time I watch it I see something I've missed before. Amelie - I just love this movie. Pan's Labyrinth - This is such a visually stunning movie, and a good story. Lis, I hope I did you proud. If anyone would like to be "interviewed" by me, email me at iliketocook at shaw dot ca. So hey! I finished planting my garden yesterday! This is the first year we've had an actual garden; we've always just tried container planting before. My thumb is not green, it's black, so I don't have a good feeling about this. But what the heck. Here's some lettuce planted in a container. I had excellent luck the first year I planted lettuce in containers - we could barely keep up with it. The last 3 years my lettuce hasn't grown but I can't give up. Freshly picked lettuce is one of the best tasting foods in the world. 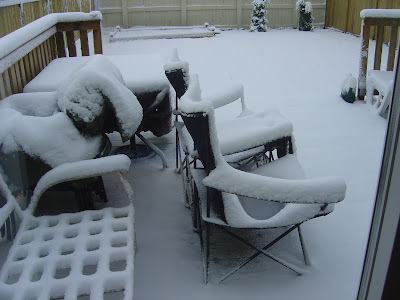 Here's my garden! Scott built it for me last month. Here's my basil plant. It was in a container in the kitchen but Scott liberated it on Saturday. I've also planted some basil seeds in the same square. I really wanted a rosemary but I went to 3 places yesterday and no one had any. Why? And what's with all the different sages at the garden centres? Where did they come from? Every year Scott insists on trying to grow tomatos and every year nothing happens. My Mom is going to bring us an heirloom tomato plant when they come next month. So he will have 2 plants. Will this year be the year Scott is victorious? 2 zucchini's next to the tomater. Carrots and Radishes! I don't really like radishes, and I have no idea why I planted them. Caught up in the moment, I guess. Here's my little buddy. He hangs out in our yard all day every day. Pour Some (boiling hot) Sugar On Me...Gateau Saint Honore. I had barely begun to recover from my first Daring Baker Challenge when it was time to start thinking about the next one. This month the Gateau Saint Honore - like this - was chosen. Gah! Big shock - I wasn't going to take part. But again I was talked into it, not by Scott this time who I think is getting tired of me being so excited to be part of The Daring Bakers and then whining about the challenges, but by Lis and Mary. 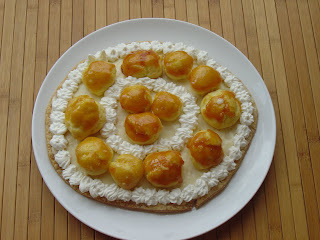 The Gateau Saint Honore has three parts - a puff pastry bottom, a pastry cream, and cream puffs. Ideally we would bake all 3 components from scratch, plus caramelize sugar to cover the cream puffs and decorate the finished cake. Did I already say Gah? Some of the Daring Bakers have already made puff pastry from scratch when the group made croissants, and of course some of the bloggers are just super fantastic cooks who make stuff like this by hand all the time! I am not one of those people, so I decided to use store bought puff pastry and make the pastry cream and cream puffs myself. I go home, take the puff pastry out of the freezer and put it in the fridge. I pour myself a drink and hope the next morning goes smoothly. Day Two (Sunday May 20) - I get to work. I roll out my puff pastry and put it back in the fridge to chill. I start the pate a choux dough. 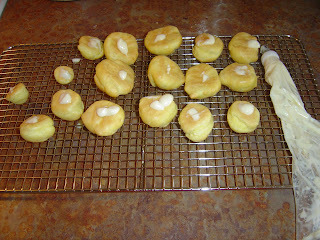 It comes together very easily and while I am adding the eggs it hits me - I am actually making CREAM PUFFS from SCRATCH. Never in my life would I have thought I would do something like this. Wow. A problem rears its ugly head! After cutting my puff pastry into a circle I attempt to pipe 4 circles of choux onto the dough and to form my cream puffs on the pan. 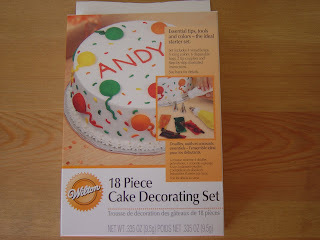 Perhaps the decorating tips I bought are not numbered the same as ones from the US but my circles are too thin and my cream puffs are small. I am having a hard time controlling the pastry bag and there is choux everywhere. Is 8:45 am on a Sunday too early to have a drink? I throw the pan in the oven and go wash my arms off. And change my shirt. And wipe down the floor. When the pan comes back out of the oven 20 minutes later everything looks good. Well, the cream puffs look good but are very very small. My puff pastry base has hardly puffed at all and is very dark, I've come close to burning it. I abandon the piping bag and make some new cream puffs with two spoons. They come out great. Next I start the Saint Honore (aka Diplomat) Cream. Having received some advice that morning from Mary this goes smoothly. And then I get to fill the cream puffs! So much fun. And yummy too - I can't wait to make these again. And eclairs, and cheese puffs too. Screw the diet, bring on the choux! 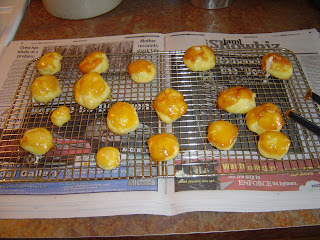 Now is the scary scary part - caramelizing the sugar and dipping the cream puffs in. I got my sugar caramelized ok but the trouble is dipping the puffs in the sugar! Neither forks or skewers work for me so I end up using my fingers. Did you know that melted sugar is really hot and burns you when you dunk your fingers in it? I'm here to tell you it does. Everything has gone pretty smoothly and I decide that I am a Superstar. So I get cocky and decide to make some sugar threads to place on the cake like a crown. Because I am just that good. But I am not that good. I spray my shirt, arms and kitchen floor with burning hot sugar. Dammit. And ow. Time for the assembly. The puff pastry base goes on the plate. It gets covered with the Saint Honore Cream. 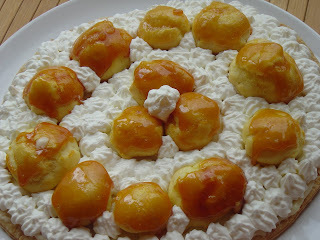 The cream puffs are placed on top and then it is time to get creative with whipped cream. As you can see from the last picture, I was not exaggerating when I said my puff pastry didn't puff very much. I am sure that is because it is store bought. But it still tasted good which is the most important thing. So in just under 4 hours which included lots of emails and instant messaging the gateau was done! I covered it and chilled it and that night when we came home from dinner (it was our anniversary) we had a piece. It was really nice and the cream puffs were my favorite part for sure. I wasn't crazy about the sugar, but that's probably because I was blistered and suffering. The downside to the cake was that it didn't all get eaten before it started to get soggy. I made the cake that Sunday because Lis and Mary were, and normally that would have been OK and I could have taken the rest of it to work on Monday. But May 21 was Victoria Day and I didn't work. Tuesday morning the cake was getting soft and I didn't want to feed to anyone. Wow, another amazing challenge down! I can't believe all the new things I have learned in the last two months. I can't wait to see what's next. 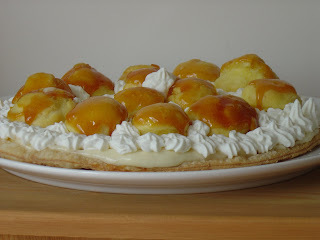 Feeling crazy and want to make your own Gateau Saint Honore? Here's the recipe. 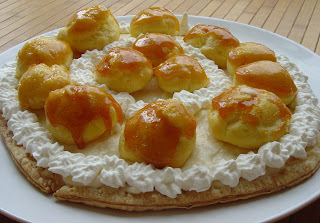 All the Daring Bakers are posting about their Gateau Saint Honore's today, Sunday May 27. Please go and drop by their sites. What: Zucchini is a vegetable from the squash family. The color of the skin can range from white to light green to dark green. As gardeners know, zucchinis can grow to mammoth sizes, 2 feet long or more. When: Zucchinis were first recorded in North America in the 1920's. It is believed it was brought from Italy to California by immigrants. Where: Zukes are easy to grow in any climate. Smaller zukes are younger and therefore more tender. Why: Low in calories, zucchini are good sources of Vitamin A, C, Potassium and Folate. Always wash your zucchini (and all fruits and vegetables!) but don't peel them - most of the good stuff is in the skin. I have made and discovered a lot of recipes and ideas while doing the ABC's of Food, and these two recipes for Z are for sure in the top 10. Enjoy! In a large mixing bowl stir together the milk, eggs, oil and garlic. Set aside. In a second bowl add the flour and whisk in the baking powder and baking soda, salt and pepper. Toss in the zucchini, cheese and bacon. Pour the milk mixture over the flour mixture and stir gently until combined. When the waffle iron is ready, pour amount of batter as directed by your machine on to the plates (I used around 1/3 cup per waffle. Close lid and cook until brown. Remove, keep warm and make the rest of the waffles. These waffles don't need anything but a knife and a fork. They are good. They are, in fact, gooooooooooooooooooood. You should try them. Now. Don't be scared, these are very good. And that's coming from me, a former blue cheese hater. Place the zucchini in a bowl and sprinkle with the salt. In another bowl mix together the rest of the ingredients. Squeeze out the moisture from the zucchini with your hands and add to the bowl. Mix well. 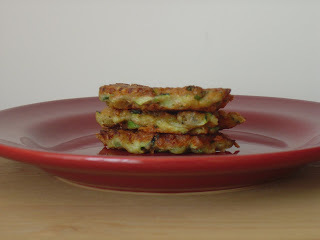 If the batter seems to thick you can add a bit of water, but the zucchini should soften things up a bit. Heat 4 or 5 tb of oil in a large pan over medium high heat. When the oil is hot drop the batter by small tablespoonfuls into the oil and flatten lightly into a small cake. Cook, turning once, until brown and crisp. Drain briefly on a towel before serving. Serve plain, or with a bit of sour cream. Isn't it May 24? Then why have I woken up to THIS? Like lots of bloggers out there from time to time I am contacted by people and companies offering to send me books or products to try and review. Sometimes I say yes, sometimes I say no. When I was asked by the folks at True Blue if I would be interested in sampling some of their products, I did not hesitate to say yes. Blueberries are so good for you; they are the most antioxidant rich food out there, they fight memory loss, are good for your eyes, and may even reduce the risk of certain types of cancer. Who would say no to something like that? True Blue were very generous in the samples they sent me - a big bottle of Blueberry Juice and 2 smaller bottles, 1 each of Blueberry Blackberry and Blueberry Pomegranate. All 3 juices were wonderful but the Blueberry Juice was definitely our favorite. The taste is very subtle and not overly sweet. True Blue do not use High Fructose Corn Syrup in their juices - how great is that? 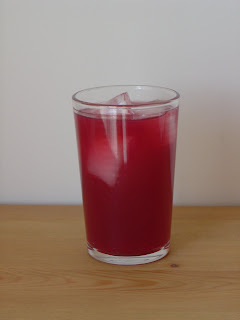 Want to be more inventive with adding blueberry juice to your diet? Check out the recipe page. Here's my Blueberry Jello! Two ingredients - blueberry juice and unflavored gelatin. It was great - the best jello I've ever had. I had to try one of the cocktails, so I made a couple of TrueBlue Lu Lemon Cocktails. I could see drinking these on the deck in the summer, if it ever warms up here. TrueBlue-sicles! 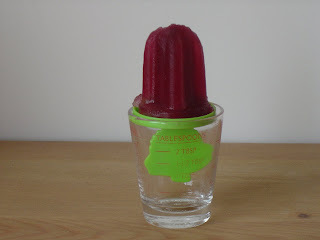 I filled up my very small popsicle molds with straight juice and froze them. They were nice and refreshing. If you have kids this would be great for the summer - much better for the kids (and you) than what you can buy in the store. 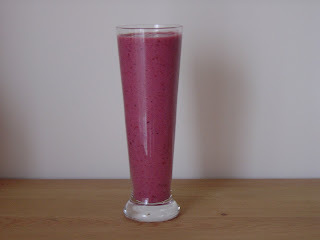 I love smoothies and I make very simple ones, usually just milk or plain yogurt and frozen berries. I added some TrueBlue for an extra healthy punch and it was delicious. Plus with the juice in there you don't need to add any extra sweeteners. Combine all ingredients and blend until smooth in blender. We've almost run out now but I've seen TrueBlue for sale in the stores here so I'll be buying some soon. I've still got to try the vinaigrettes - they have recipes for two, plus the Margarita and the Witches Brew. And maybe a fruit soup? Or a granita! Jelly too. Maybe some kind of quick bread? So many possibilities! Over at Food For Thought, the blog at Food Network Canada, Catherine has started a cooking club, where every month the participants will all cook a recipe from the FoodTV.ca website. This is the first month, and the recipe that was chosen is from Michael Smith, who has had three shows on the Food Network - The Inn Chef, Chef at Large and Chef at Home. Chef at Home is one of my favorite shows on the Food Network and is the highest rated Canadian food show on the network. This month's recipe (and the first time I have cooked a recipe from Michael Smith) is "Buffalo" Chicken Wing Salad with Blue Cheese. What a great salad! Scott couldn't even swallow his first mouthful before telling me to make sure I wrote this recipe down so we could have it again. I made a few changes to the original recipe; I reduced the butter and increased the ketchup in the dressing, which made it thicker but still delicious. I also cut back on the amount of chicken and blue cheese and added chopped tomato. If you want to take part in the Cooking Club, the deadline for this month is May 31. Email Catherine at blog AT foodtv.ca. Place the lettuce in a large bowl. Scatter the tomato and celery over top, and squeeze the lemon juice over the salad. Set aside. Heat the oil in a large pan over medium high heat. Toss the chicken and flour together. When the oil is hot add the chicken and cook until the chicken is brown and crisp and cooked through. Remove from the pan and drain briefly on a paper towel. Make the dressing by whisking together the butter, hot sauce and ketchup. Place the chicken in a small bowl and toss with 2 or 3 tb of the sauce. Top the salad with the chicken and the blue cheese. To serve scoop the salad onto plates and pass the dressing on the side. Serves 2 as a main course, if your husband eats like mine does. In April I mentioned here how much I love del.icio.us - a very cool site to bookmark websites and pages you want to see again. I think it's better than bookmarking them on my computer because by using del.icio.us I can access my bookmarks from any computer, anywhere. And this way I can mark recipes I find on the internet without having to print them off; using lots of ink and paper each time. And that is a good thing. The bad thing? On May 16 my recipe count on del.icio.us hit 100. And that is not counting recipes that I've already tried and deleted. That is 100 new recipes waiting for me to try them, in addition to all my cookbooks at home, plus my 8 notebooks already full of recipes from my head, friends, magazines, books, and the internet. Plus all the recipes I come across each week from the links I regularly check out. OMG you guys!!!!! That's a lot of recipes. So in the spirit of Weekend Cookbook Challenge (which, if you didn't know, is a monthly challenge to cook from never/seldom used books/magazines/whatever in your collection), each week (possibly) I will cook and tell you about a recipe I have bookmarked in my del.icio.us. SO! To start us off, this weeks recipe was bookmarked by me on November 22 2006. 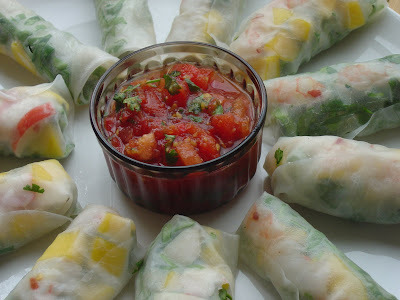 From Once Upon A Feast, the blog of the lovely Ruth, here's Vietnamese Summer Rolls with Thai Salsa! 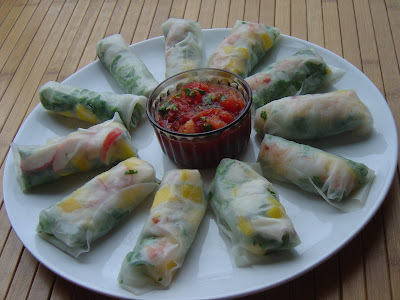 I remember the first salad roll I ever had - from Granville Island Market in Vancouver BC. It was huge and very tightly packed, something I can never achieve, with a straight row of shrimp running right down the center, the pinkness brightly visible through the rice wrapper. Ah memories. Ruth's rolls have a few twists that set them apart from the more traditional rolls. There are no noodles, and the rolls are served with a tomato salsa full of Vietnamese seasonings - fish sauce, ginger, and cilantro are the 3 strongest. And mango? Yes please! We used spinach in place of the lettuce for the filling, and Scott made some rolls with crab flavored pollock. I substituted a bit of soy sauce for the fish sauce in the salsa. The salsa is outstanding - sweet and spicy. I've got some leftover in the fridge, but I don't think it will last long! What: Yogurt is a dairy product made of milk and bacteria. Yum. Where: Yogurt can be made anywhere; factories or homes, from the milk of many different animals including goat and sheep. Cows milk is the most commonly used. Yogurt can also be made from soy. When: Yogurt making is thought to have started by nomadic Balcan tribes thousands of years ago. Why: Yogurt is a good source of B Vitamins, Calcium and Protein. It is also thought to keep the intestines filled with good bacteria. Did you know? Americans eat over 300,000 tons of yogurt per year. Great fast dip that can be served with pita bread for dipping, in sandwiches, with souvlaki or in salads. Squeeze the moisture out of the cucumber with your hands. Mix all ingredients together. Season with salt and pepper if desired. A funny story about tatziki. Years ago I worked at a restaurant and one of the appetizers on the menu was Calamari with Tatziki Sauce. Half the time our tatziki sauce was praised by the customers; other times people complained that it wasn't very good. We couldn't understand why; all the prep cooks during the day used the same recipe and if we ran low at night, those cooks were using the same recipe too. The owner finally figured out what was going on one day when she came in for lunch. The prep cook working that day had peeled, seeded and grated the cucumber. She'd put it in a colander and sprinkled it with salt. The next step was to squeeze the moisture out of the cuke (after letting it sit for a while) and mix the grated squeezed cuke with the yogurt and other ingredients. What did my boss see the prep cook do? Squeeze the liquid out of the cukes, then throw away the cucumber and mix the liquid into the yogurt! Mystery solved on why the tatziki sucked sometimes. PS - before you ask why no one on the staff had noticed that some times the tatziki had no cucumber in it, I'm not sure. I didn't eat Calamari back then so I never tried the tatziki. Pasta with Peas and Zucchini. Boil a large pot of water; salt and cook pasta until done. Drain and set aside in a bowl. Just before the pasta is done, bring another pot of water to the boil and add the peas garlic and zucchini. Boil for 2 minutes and remove the vegetables from the water, keeping the water in the pot. Finely chop the garlic. Toss the veggies into the pasta. In a large heat proof bowl mix together the yogurt and basil. Season to taste with salt and pepper. Place the bowl over the vegetable water (like a double boiler) and heat the yogurt, stirring often, until warm, 2 or 3 minutes. 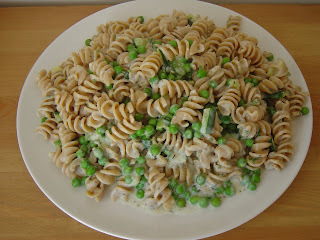 Pour the yogurt over the pasta and vegetables and mix well. Serve. 2 big servings, for breakfast, lunch or dessert. Crush the cookies in a food processor, or place them in a bag and smack with something heavy until broken up. Set the cookie crumbs aside. Puree the berries in your food processor. 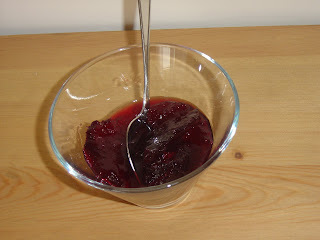 Scrape the berries into a bowl and mix in the maple syrup to your taste. Place half of the yogurt in the bottom of two bowls (so 1/4 of the yogurt per bowl). Top with half the berries and half the crumbs. 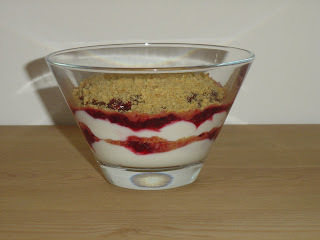 Repeat with the remaining yogurt, berries and crumbs. Serve straight away, or cover and refrigerate. You guys....next week is the last letter! Wow, I don't know whether to be happy or sad about it. Have a great day, and for you Canucks out there, have a safe long weekend! I have been a bad blogger - I've missed many, many Presto Pasta Nights hosted by Ruth at Once Upon A Feast. And we just can't have that, so I'm back this week with a dish that I "invented" with the help of Jamie Oliver. I have a (bad) habit of having the TV on as background noise when I am home. A couple of weekends ago Jamie Oliver's new show Jamie at Home was on. I wasn't paying attention until the last few minutes when he was putting the final touches on a baked pasta that looked very very good. I searched the web, but could not find any recipes from the show. Then this Sunday I again had the TV on while doing some cleaning and again Jamie came on. This time though, as the dish started to look familiar I ran for some paper and started taking notes. I made my version for dinner that night and it was quite good! I will make some modifications next time, but overall this is definitely something I will make again and again. Jamie Oliver used cannelloni, but I had rigatoni, which is just little cannelloni pretty much. He also used creme fraiche and Parmesan for the sauce and Parmesan on top. They don't sell creme fraiche here so I used sour cream. I thought I had Parmesan in the fridge but I didn't, so I had to use feta and mozzarella. I liked them both, but next time I might try the Parmesan out. Make the filling: Cook the broccoli and cauliflower in boiling salted water until very tender, 10 to 15 minutes. A couple of minutes before they are done, heat the oil in a large pan and cook the garlic until soft. Add the chile flakes and cook a couple more minutes (JO threw in some anchovies at this point, I didn't). Drain the veggies and add them to the pot. Cook until the veggies are all broken down (I used my potato masher at the end to help them along). Season with salt and pepper. Remove from the heat and set aside. Preheat the oven to 400'. Pour the pasta sauce into a baking dish (I used an 8X8 dish). 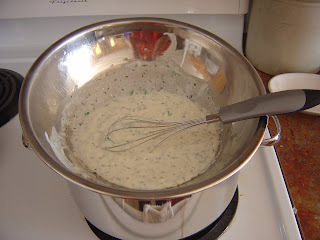 Mix together the sour cream, feta and green onions. Season with salt and pepper if needed, and set aside. With a piping bag, baggie, spoon or whatever, fill the pasta with the mashed veggie filling and place the pasta in rows in the sauce. Repeat until you run out of room or shells. I ran out of room, so I just spread the leftover filling on top. Cover with the sour cream and feta sauce and then with the cheese. 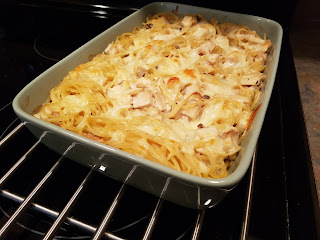 Bake until the pasta is cooked through, 30-40 minutes. Let stand for 10 minutes before serving. This is a recipe that my mom used to make when I was little. When I moved out on my own I made sure I had a copy of the recipe packed away. 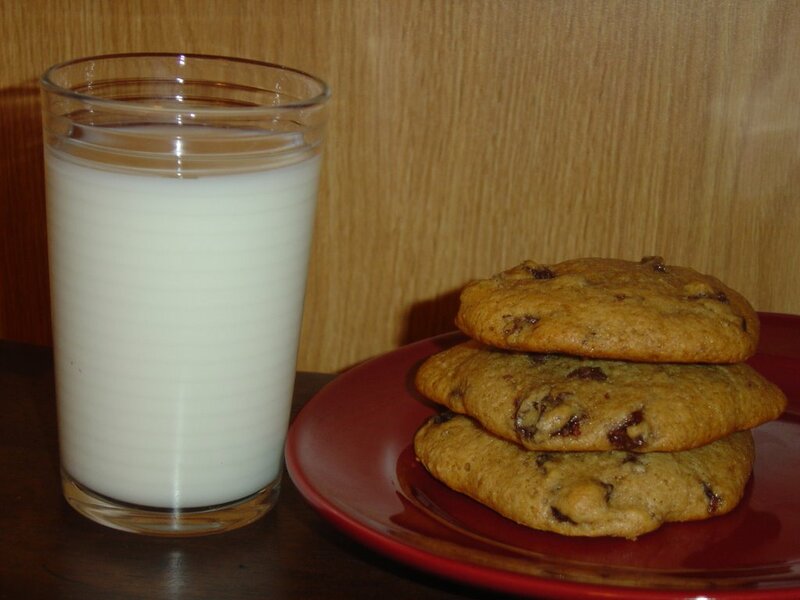 The cookies are very moist and cake-like and totally delicious. I think they taste best in the fall and winter, but don't ask me why. I guess cinnamon and nutmeg always mean cooler weather to me. Don't be put off by the sort of vague directions with the water, you can't really mess these up. They make a good snack and an even better breakfast with a cup of tea. In a large pot combine raisins and spices. Cover with water by 1" over the raisins. Simmer uncovered for 20 minutes. Let cool slightly. In a large bowl mix the remaining ingredients and add the raisins and water. (This is best done in a stand mixer). Dough will be soft and sticky. Drop by large spoonfuls onto a baking sheet lined with parchment and bake at 350' for 15 to 20 minutes. Raisins are high in fibre, potassium and antioxidants. So I am sending this Cate's way for Sweetnicks ARF/5 A Day. First off I would like to say HAPPY MOTHERS DAY to my Mom! I hope you have a good day; make Dad take you out for lunch. Second - the round up for WCC 16 is up. Click here for your enjoyment. 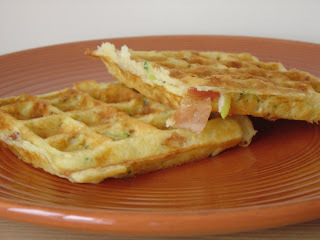 The next WCC - # 17 - will be hosted by Ani of Foodie Chickie. The theme is Cornmeal. Email her your post by June 11 at foodiechickie at yahoo dot com. What: Food that has been, in the words of Emeril, kicked up a notch. There are many ways to make food xtreme. You could use uncommon ingredients such as snake or alligator; up the calorie and fat count; or add extra special ingredients to a dish. Where: Where ever there is an adverturous soul, or a crazy fool, there is Xtreme Food. When: Oh, whatever. Only 2 more letters after this, thank god. Why: Cause we are crazy fools, and my Dad (Hi Dad!) suggested it. 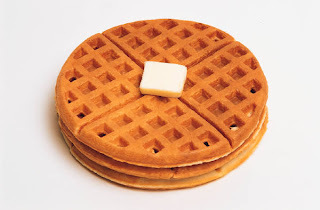 This here is a waffle. 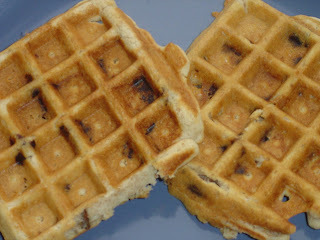 This HERE, get ready for it, is AN XTREME WAFFLE! We took a batter for regular, plain old waffles and added chopped cooked breakfast sausages and maple syrup. Then we cooked them like usual. Dee-lishous. But then Scott, he must have lost his mind! He went and upped the ante even more, I didn't think it was possible, but he did. 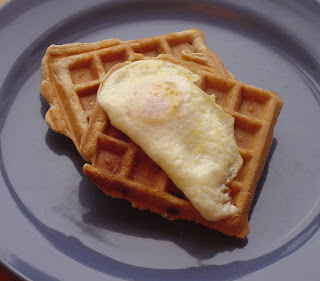 He added a fried egg to his XTREME WAFFLES. 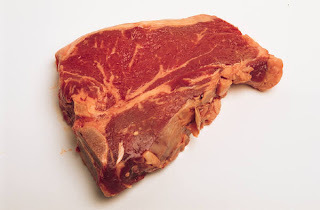 And here we have a steak. But HERE is AN XTREME STEAK SANDWICH!!!! A thing of beauty. We've spread garlic butter on grilled bread and topped it with medium rare steak, sauteed mushrooms AND blue cheese! Can you feel your ateries clogging? Up next, a tall cold glass of milk. 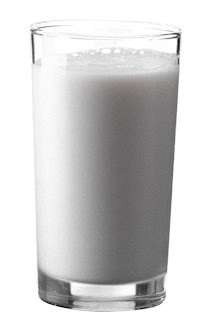 THE XTREME glass of milk, THE SCOOTER! Baby can you feel it; milk mixed with booze. What could be better or more Xtreme? And oh my it is delicious. Whoooo, I'm exhausted! That was a lot of XTREME, my friends. See yous later. Wow, May's installment of Weekend Cookbook Challenge really snuck up on me. The last day to get your posts to me is the 12th which is just days away! This month's theme is Something New. There are so many ways to interpret that - a new book, a new ingredient, a new technique, a new author - are just a few that come to mind. I have gone with 3 Something News in my post today - a new magazine, a new vegetable and a new product. Scott bought me a copy of Better Homes and Gardens Mexican Magazine a few weeks ago. I love Mexican food so I want to make pretty much everything in the magazine but the recipe that jumped out at me first was for Potato and Cheese Stuffed Chiles. We recently started shopping at Safeway again after boycotting them for almost 6 years (long story). I've noticed Anaheim Peppers in the produce area but I didn't know what to do with them. Until my new magazine! These peppers were really great; very flavorful and light. It takes about an hour to get them together, but half of that is oven time so that's not bad. Another good thing about them is that the magazine has calorie and fat listings for all the recipes in the magazine. One pepper half comes in at 79 calories and 2 grams of fat! If you have access to Anaheim peppers, give this a try. Cut the peppers in half lengthwise. Remove the seeds and membranes. Simmer the pepper halves in boiling water for 5 minutes. Remove and drain well. Cook potatos in boiling water until tender. Drain and mash the potatos with the milk until smooth. Mix in the green onions, chile powder, garlic, egg white and half the cheese. Place the peppers in a baking dish. Stuff the pepper halves with the potato filling. Cover and bake at 350' for 30 minutes. Remove from the oven, sprinkle with the rest of the cheese, recover and let sit for 5 minutes. My last something new is this spice blend - Tajin Fruit and Snack Seasoning. I bought this at the Calgary Farmers Market. It's a blend of salt, ground chile peppers and dehydrated lime juice. The lady who sold it to me says it's best sprinkled on watermelon so we gave that a try. It was really delicious. I'm going to try it with cucumber as the website suggests. If you would like to take part in Weekend Cookbook Challenge, please do! Email me your post by May 12 at iliketocook at shaw dot ca. Hope to see you at the round up next week!